There are four basic types of needles for tattoos. Some of them are designed for specific use, others can vary depending on how the tattoo-master uses them. Below we give a general explanation of the categories of needles and how you can use different types of needles. Round Liner, Round Shader. 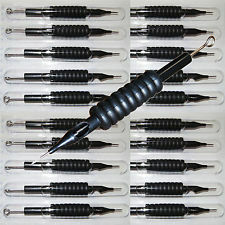 These are needles brazed by bundles, standard soldering includes from 1 to 18 needles, and visually such soldering is an ideal circle.Round Liner assumes bundled bundles, which are suitable for creating thin, medium or fat lines; with certain skills you can paint small spaces by using them.Round Shader assumes not tightened bundles; it is used for shadows in color and black and white works.There is a special group of beams. It is Tights Round Liners, which assumes needles tightly stapled to the point; they are used exclusively for the lines. Depending on how brave your plans are, you can choose from 3 to 18 needles for these purposes. Flats, Double Flats, Stacks are tightly welded to each other needles in one or two rows; they are used for coloring large areas. Such needles are applied in various techniques, for example for the image of clouds and waves. Needle range is from 4 to 15 needles. Magnum is the most popular version of needles for shading and shadows; it is used to perform work in different techniques. Round-Curved Magnum is the Magnum fused with a crescent to avoid incisions which are often left by the usual magnum. There is a possibility of greater maneuverability in hard-to-reach places. Needle range is from 5 to 49 needles. S (Short) – a short sharpening, it is also called a bullet.